Hops farmers in the Hallertau region of Germany like to call their product the spirit of beer. 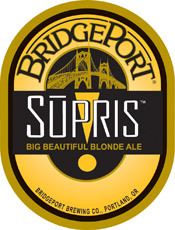 Although BridgePort Brewing brewmaster Karl Ockert chose to showcase a hop from Slovenia in BridgePort’s newest beer he understands the sentiment perfectly. Ockert took a side trip to the Slovenian farms last year on the way to Munich to serve as a judge at the Brewing Industry International Awards. He was taken not just with the Styrian Golding hops that ended up in Sūpris, but the spirit of hop farms themselves. Most are 15 to 20 acres in size – compared to the 450 acres in the Pacific Northwest – and each farmer operates an independent business. “The had their own pickers and bailers. Their kilns were about the size of my office,” Ockert said. He decided right then to buy specific lots. By the time he headed home to Portland, Oregon, he’d made a similar choice of malt – a variety of pilsner a colleague come across while touring Bavarian malt houses – and picked out a couple of bottles of Belgian beer he particularly liked. Eventually he would harvest the yeast from them. BridgePort brewed 10 test batches of the beer that would be Sūpris, ranging from 5% abv to 10%. The final release, 6% abv, manages to showcase all the ingredients. Sūpris is notably fruity, with banana and fleshy fruits throughout, and has just enough hops at the finish to keep it from being sweet. The Styrian Golding hops mingle perfectly with spiciness from the yeast, providing distinctive aroma and flavor. Ockert chose these particular Styrians from the Slovenian lowlands. “Another year the hills might have been better,” he said. How will he know next year? “I hope I’ll have to go back,” he said.